Reel Life Charters is a (cleverly named) new fishing charter business based out of Sooke, BC. A brief journey from downtown Victoria, delivers an amazing marine experience. 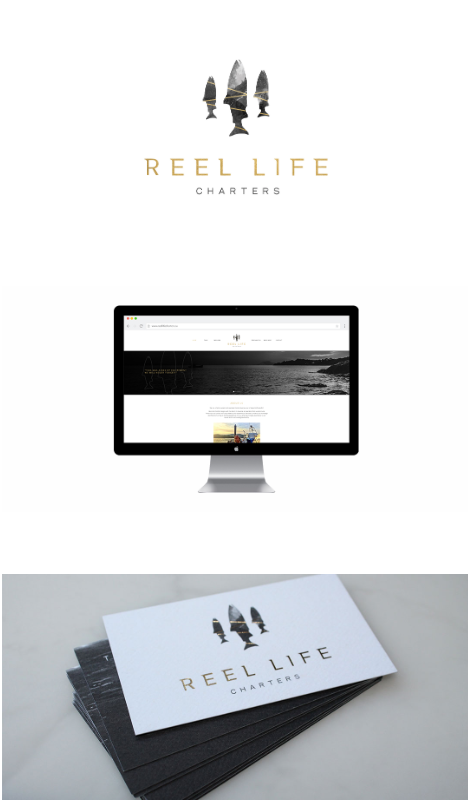 Reel Life Charters asked Meade Design Group to design a logo brand for the company that was both west coast inspired and refined. We applied a unique grey-scale texture, withintersecting gold bars to 3 Chinook salmon, making the logo mark stand out boldly. The typography is simple, but is both a subtle mixture of classical serif fonts and sans serif fonts, making it contemporary and distinctive. We foiled the salmon with gold foil on top of a rough textured business card, making the final product truly elegant. Accompanying the beautiful business cards, Travis asked us to design the website, gift certificates, thank you cards, and water bottle labels that he can give out to fishing clients. Feel free to checkout the website for yourself at: reellifecharters.ca to see some of our work in action, and be sure to check them out for your next adventure fix!